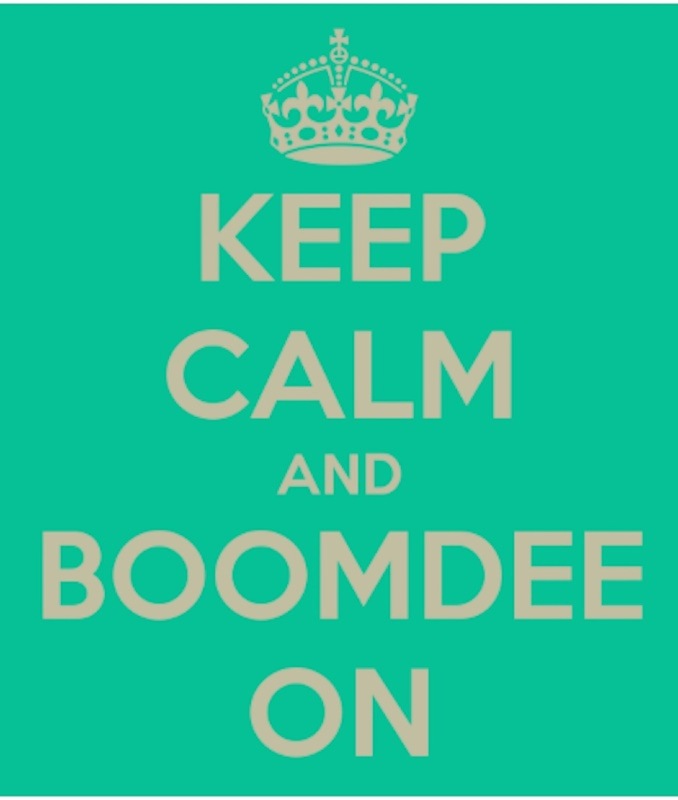 Did you hear that long exhale? It’s been one of those weeks in the garden. A squirrel shredded my garden swing cover. …and the dreaded squash bugs descended on my beloved pumpkins. I spotted a single squash bug on the side of the house in early spring. Thanks to a dry, warm winter, they happily overwintered. Further reading tells me they’re a hardy bunch and can survive under a blanket of snow. In any event, they’re back. Unfortunately, the irrigation in the decoy box stopped working. Pumpkins are thirsty plants, and by the time I realized, it was too late. Whether or not it would have worked is anyone’s guess, but it’s now a moot point. A colony of squash bugs are now residing om my beloved deck-top vines. I’ve learned a thing or two from a handful of sites, but nothing that gave me any hope. 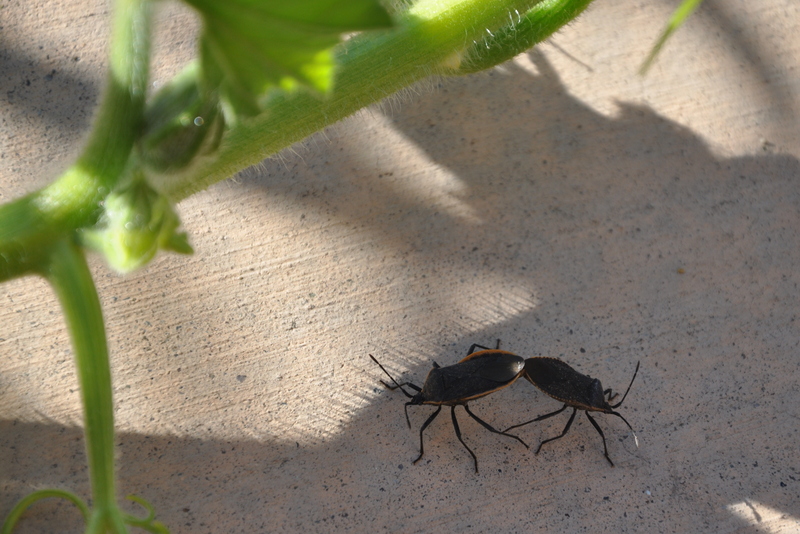 Apparently squash bugs need the squash to reproduce. They’ll go in search of other food, but it’s not until they find a squash plant that they set up house. 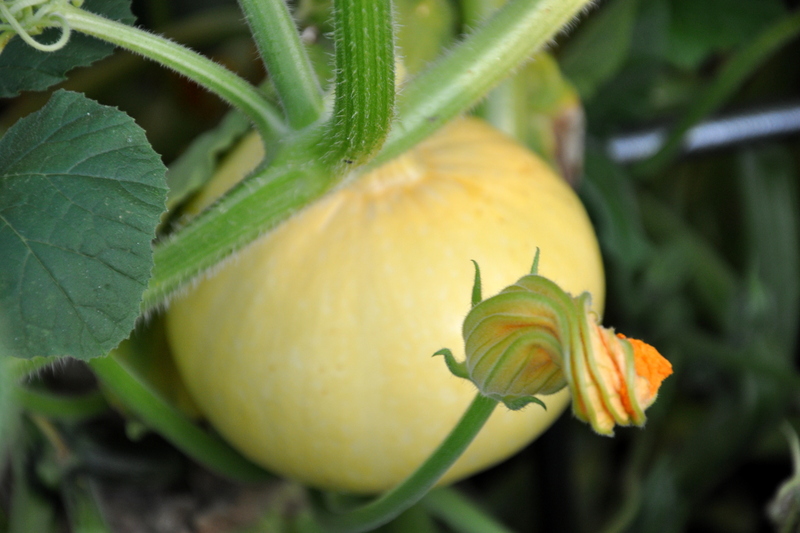 Some of the professional growers plant ‘sacrificial’ crops like pumpkins (what!!!) to defer the damage away from pricier crops in the same family. Imagine choosing cantaloupe over pumpkins. Why I never!!! After last year’s debacle, I assumed the bugs liked the fruit alone and that I would be safe until then. Nope! They lay eggs on the underside of the leaves. The squash bug causes severe damage to cucurbits because it secretes highly toxic saliva into the plant. The foliage is the primary site of feeding but the fruit is also fed upon. 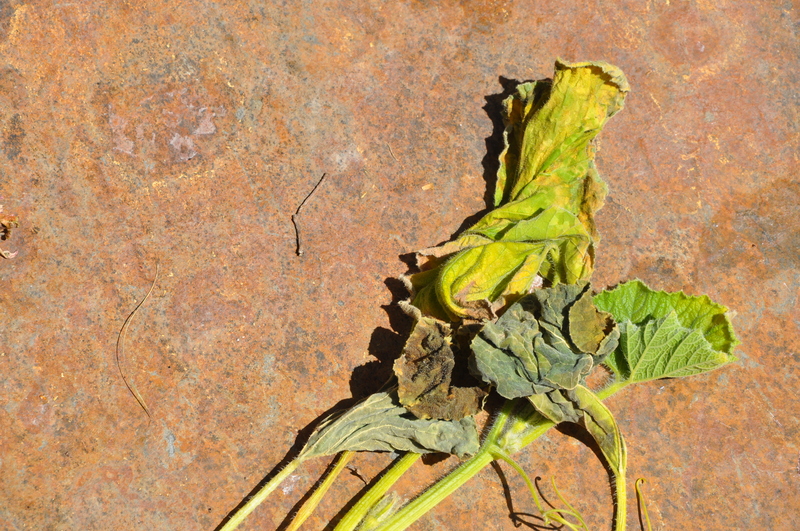 The foliage wilts, becomes blackened, and dies following feeding; this malady is sometimes called “anasa wilt.” Often an entire plant or section of plant perishes while nearby plants remain healthy. The amount of damage occurring on a plant is directly proportional to the density of squash bugs. The plants look healthy. I’ve been knocking the large bugs off the leaves, but I’ve yet to go in search of the dreaded eggs. The bees are a buzz every day, moving from flower to gorgeous flower. A couple of pieces of fruit have reached the size of a baseball. Regardless of the outcome of this year’s crop, it might be time to take a year off between plantings. I know a lot of gardeners rotate crops for this reason. I took a break from growing tomatoes after a nasty tobacco (tomato horn worm) infestation. They’ve been fine ever since. 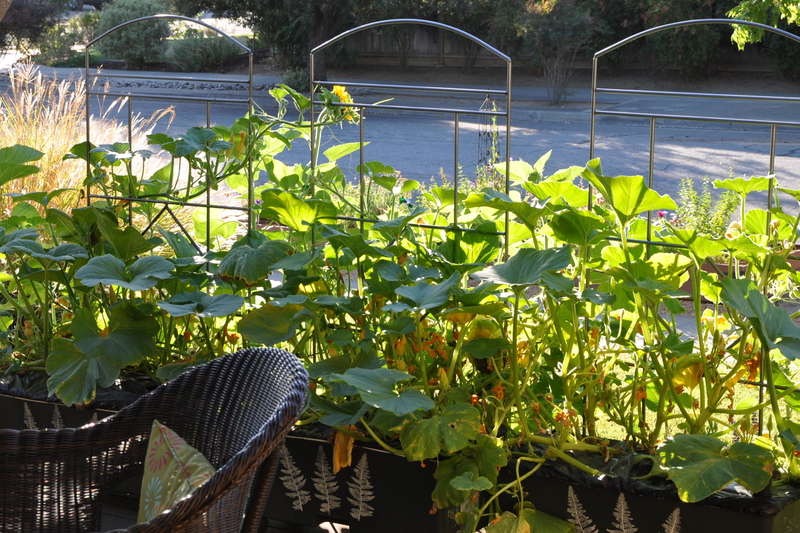 This entry was posted in Gardening and tagged growing pumpkins, growing pumpkins in EarthBoxes, John Capinera, old farmer's almanac, organic gardening, pumpkin pests, squash bug, squash bugs, stink bugs, University of Florida. Bookmark the permalink. 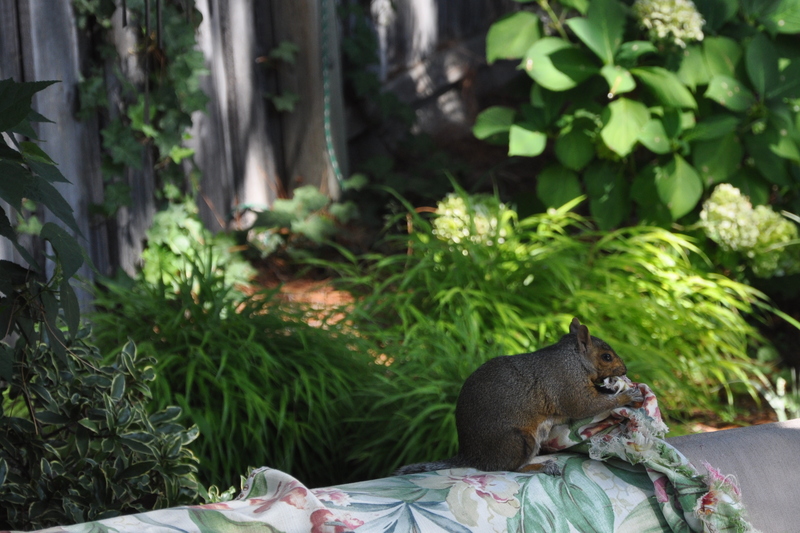 I think the squirrel should have to make amends by picking the squash bugs for you! Seems only fair. Good luck – I know how much you all love your pumpkins for Halloween! You’re so funny. C. enjoyed gardening with me until he was five. The end. M. loved it, especially pumpkins, watermelon and enjoyed receiving seeds in his Christmas stocking for many years. He has but a casual interest now, and today helped arrange the direction of the pumpkin vines. Mike planted a vine and installed a trellis this very weekend, but he does it for me, not out of any real love of gardening. He says hix mom made them pull dead weeds from the hillside at home for hours in his teens, so he doesn’t have any pleasant memories. We do love our pumpkins. Thanks for remembering that. If our crop is destroyed, we’ll have plenty of local farms to visit for our own Jack ‘o lanterns. It will be great fun if I can make a go of this crop though. I’m answering in reverse order, so you already know I was hard at work today trying to slow down the onslaught. Thanks for your support, Dani. That means so much to me. When you give your vegie beds a rest, do you plant a cover crop or just leave them empty? One year I used one of the two boxes for composting, and now wonder if that was a good or bad idea as far as overwintering bugs are concerned. I’ll have to see what more I can find out. By the way, I love hearing expressions unique to your region. I’ve not heard “rot your socks” before but it sure made me smile. Oh dear – hope you manage to find all the greedy little bugs and their eggs before they start nibbling. Good luck! Cathy, I sure made a concerted effort to do just that today. It’s funny, but once I donned my gardening gloves, I wasn’t as put off by their presence. They walked on my gloves and I added them to the bucket. That is one seriously naughty squirrel! It’s disheartening to see the fruit and vegetables you have lovingly cared for destroyed, I lost all the garlic and half the onions this year to something – voles, rats, a giant ugly looking cricket thing! – who knows?! All I know is, I wanted to cry. I hope you can breathe lighter this week 🙂 Gardening certainly is designed to test us! Oh Aileen, I feel for you. That’s a lot of crop to lose. It seems to be a trend today. I’ve read of crop loss on two or three blogs. I would have cried, I’m sure of it. Its an extra challenge when you want to garden humanely and organically, but it’s the only way for me, so I have to get creative. Today I picked off adults and many eggs. I hope I made a real dent in the problem. Thank you for your well wishes and support. Best of luck to you too. It is so difficult when factors outside our control mess with our beloved plants. I’m so sorry it’s been such a rough week. I know it would be hard to rotate out your pumpkins for a year, but it may be the best option. That photo of the developing pumpkin is lovely, by the way. In terms of things outside our control: Each morning I go out to water and replant the transplanted sunflowers. Some critter digs them out, tosses them aside, and leaves them. Huh. Laurie, I always puff up a bit when you compliment my photos. You’re so gifted…it always means a lot. I’ll see how the season ends, but you’re right, its probably time to rotate them out for a year. Further, if we have one more year of drought, it would feel irresponsible to grow *anything* superfluous. I had to smile at the vision of you replanting your sunflowers. You’ve got to wonder, eh? I wonder if they digger is simply after grubs or worms under the plant, and finds it easier to dig up freshly tilled soil? You could try a ring of heavy rocks or bricks to see if that doesn’t deter them. Gardening is a darn good metaphor for life. John Lennon said it best: Life is what happens while you’re busy making other plans. Keep me posted on those sunflowers. My first one came into bloom this week. Glorious! What a shame – I know how fond you are of pumpkins! I hope so – it is such a shame when these things happen. Well phooey on those rotten and ugly bugs. Curses, what a drag. Does the male just wonder by and fertilize laid eggs too? Lazy or what? The jig or something…ha. Probably making squash babies is what he’s doing the little jigalow. I like Pauline’s idea of companion planting. Hopefully that’ll help. Here’s a few idea’s on Pinterest. I hope you have Halloween pumpkins, I know how much you love to grow your own. I learn so much from you, Pauline and others. The idea of companion planting is a good one. Hand picking is gross but really effective. Pinterest has really expanded. I wouldn’t have thought to look there for this sort of article. Thanks for letting me know.